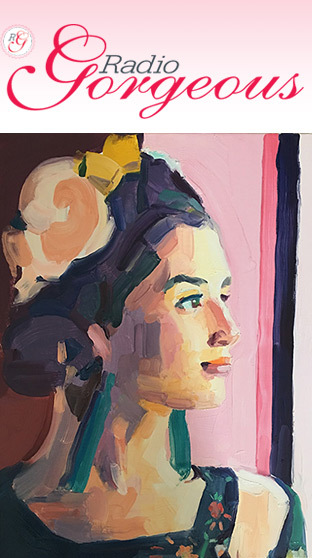 Once again the Rebecca Hossack gallery presents another stunning exhibition, this one appropriately titled, “Gorgeous”, featuring works by Barbara Hoogeweegen and Mara Torroba. Gorgeous features portraits of women by both artists, who each have their own unique and equally stunning techniques in which they choose to create their interpretations of beauty. “Gorgeous” refers to the physical attractiveness of something – how beautiful it is. Beauty is a characteristic of an idea, animal, object, person or place that provides a perceptual experience of pleasure or satisfaction. Although beauty is perceptual and open to opinion, viewers will find it extremely hard to deny that both artists’ works on display are anything less than beautiful. Madrid-born artist Maria Torroba focuses on using the Renaissance for inspiration. Renaissance art marks a cultural rebirth at the end of the Middle ages and the rise of the Modern world. One of the distinguishing features of Renaissance art is its highly realistic linear perspective. The development of perspective was part of a wider trend towards realism. Painters then developed other techniques, studying light and shadow, and famously in the case of Leonardo da Vinci, human anatomy. Torroba uses da Vinci’s ‘Vitruvian Man’ in her works seen here, thus creating giant collages of women, using the Vitruvian Man as their faces. Torroba uses Spanish and Belgian linens and antique lace embroiled by her grandmother in her collages, along with shells she collects on her travels. “Frida Tudor” is instantly eye catching as the stunning red used for Frida Kahlo’s dress and lips blaze across the gallery. “Mariana Dark Pink” shows a classically dressed woman holding what is possibly a bag that has been decorated with magazine cut outs of models, giving this mesmerising piece a classic archaic aesthetic with a modern twist. Torroba’s portraits exude elegance and regality, with their bold, rich colours, and the subjects all holding themselves with perfect posture. Barbara Hoogeweegen is a Dutch artist living in London, working with oil on canvas. Her works are themed around the female psyche and identity. Viewers will have their breath taken away as they enter the upstairs of the gallery where Hoogeweegen’s work is on display. 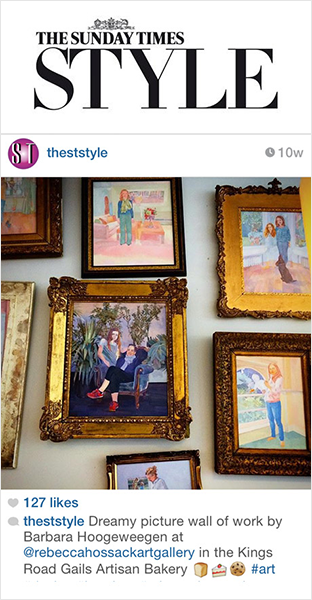 Her oil-painted portraits are objects of pure beauty. 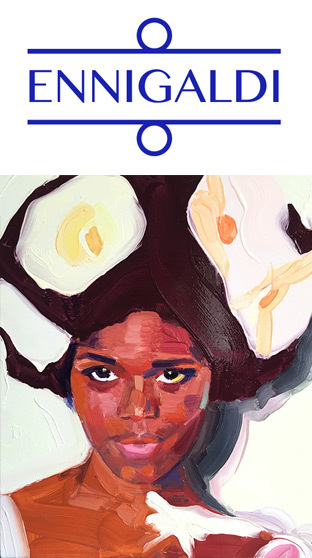 Each subject of the paintings is completely different from the last, showing women of all races, ages and styles, yet the series exudes a vibrant and bewitching sense of unity. Many of the paintings contain floral themes, with the women wearing floral headwear against bright, colourful backgrounds. “Eye of the Storm” immediately catches viewers’ eyes as the model’s striking white hair contrasts beautifully against her dark skin from which piercing blue eyes stare straight into the eyes of the viewers. Each and every woman featured in Hoogeweegen’s paintings is not only beautiful, but strong and powerful in their own way, with each canvas overflowing with the confidence of the women inhabiting them. Hoogeweegen’s paintings are carefully orchestrated, and yet also flow freely across the canvas. The various expressions and many pairs of eyes in this series of works create an incredibly intimate relationship between painting and viewer. “Gorgeous” truly is, as the name suggests, a simply beautiful collection of works. The exhibition is on at Rebecca Hossack Gallery, Conway Street until the 26th May. More information may be found here. Barbara Hoogeweegen’s Inevitable exhibition covered in The Sunday Times Style section: “Dreamy picture of work by Barbara Hoogeweegen at the Rebecca Hossack Art Gallery. Barbara Hoogeweegen’s paintings, based on photographs she has taken of her subjects, seem to deal with the unsaid, perhaps the unsayable. 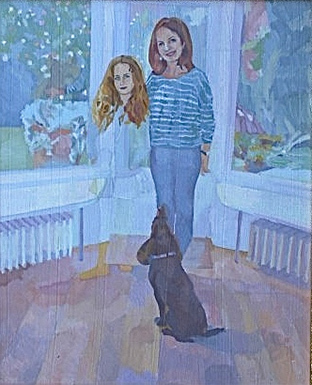 On the surface, they are well executed, small-sized (average dimensions 32 x 26 cm) works of mothers and their mostly teenage children in the idealized urban setting of Notting Hill. Using oil on board and a subdued palette, the artist shows us the immaculate interiors, the well-groomed Tabithas and Justinians, the light pouring in at well-scrubbed windows, the family dog – and yet. Underlying all this, written in to the calmly worked brush strokes, there is loss, whether by death (mother or child) or parting (grown up child leaving home, parents getting divorced). Hoogeweegen achieves this by overpainting sections of her child figures so that they appear to fade into the background. It suggests too that the mother figure might already be starting to calibrate the days before her child will be wholly gone. 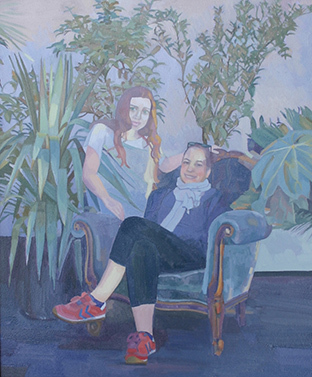 The paintings depict happiness certainly –- mother and daughter holding hands, heads together on a sofa, everything that parental love, Notting Hill and good schools can bestow. But what are we to make of the school satchel on its own, the abandoned toys, the set of Russian Dolls where the final, smallest one of the four has faded until only the pale outline remains? And what of the mother whose arms hold an almost bleached-out baby who seems to be reaching out through a window to the blue sky beyond? The hang is awkward, a two-tiered arrangement that makes the top tier difficult to see. Perhaps the unsayable here is also the untouchable, the pain of child loss too great to confront directly. Panels normally used for adverts are being used to display the art. Two lifts at a south London Underground station have been transformed into a public art gallery. Students from the City and Guilds of London Art School have used 20 A1-sized panels inside the lifts, usually used for adverts, to display their work. The ‘Art Lift’ has been organised by art agency Art Below which comes up with new ways to display art in public spaces in London. The artwork will be on display at Kennington station until 12 September. Students at the City and Guilds art school are taught the traditions of painting, sculpture and printmaking within a contemporary context. The public art display coincides with the Cleaver Square-based school’s fine art show next week.